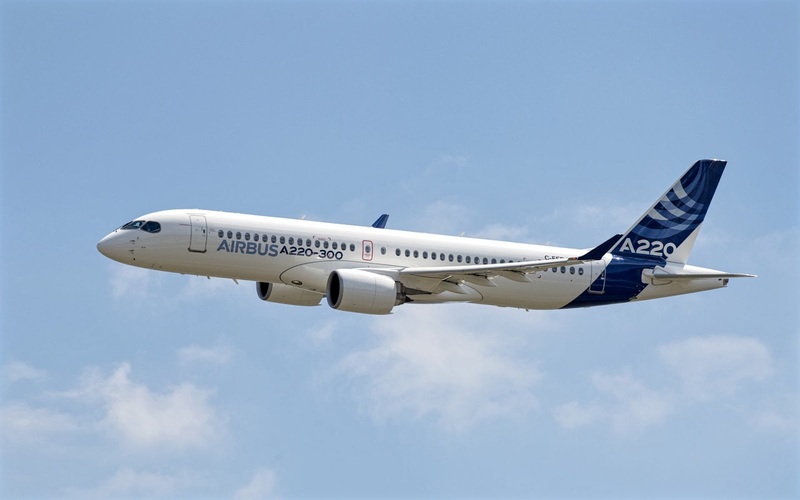 Airbus Announces New A220 Series, Rebranded From Bombardier CSeries. In 2017 Bombardier had problems with Boeing and the US government, regarding its newest type of aircraft, the CSeries. Boeing said the CSeries aircraft was heavily subsidized by the Canadian government and filed a complaint with the US Department of Commerce. The Trump administration sided with Boeing, and proposed a ~ 300% tariff on US airlines. Delta has 75 CSeries aircraft in order, calls this absurd, and says they will not pay the fare, but they still hope to get the aircraft. Bombardier came up with a creative solution to avoid this sales duty by selling the majority of the CSeries product to Airbus. The timing was interesting, since it was clearly something they had been working on for even before the tariff issue arose. Airbus took over the program on July 1 of this year. I still have not had the opportunity to drive the C Series, although I did see one in a Swiss uniform at the Zurich airport two weeks ago. Airbus today held a major press event in Toulouse, where they announced that the CSeries will be renamed Airbus A220, with immediate efficiency, which will be adjusted to the brand of Airbus aircraft (think of A320, A350 and A380). Using the numbering series '200' makes sense, since it is a smaller aircraft type than most A300 series. The A220-100 is designed to accommodate 110 passengers, while the smaller A300 series is still being produced (the A319) is designed to accommodate 124 passengers. Airbus stopped producing the A318 model in 2013. In total, 402 variants of CSeries / A220 have already been ordered, with only 36 delivered, to Switzerland (22), AirBaltic (9) and Korean Air (5), so the production line will be busy for many years. The director of the CSeries program expects to sell 3,000 marks in the next 20 years. Airbus will take possession of most of the actions in the C series program without investing directly in other Bombardier activities. The new structure does not give Bombardier any voting rights, but requires the Canadian company to continue investing in the program. This means that Bombardier will need to invest at least another USD 225 million in 2018 and USD 350 million in 2019, as well as another USD 350 million in total in the two subsequent years. Airbus and Bombardier will jointly make other investments after 2021 in proportion to their shares. However, the overall percentage of Airbus shares in the program remains a secret for the time being. The development of the C-series program had put the Canadian manufacturer of aircraft and trains Bombardier in financial difficulties after production costs for the new model had skyrocketed. The governments of Canada and Quebec intervened last year and provided the company with a generous rescue agreement, criticized by many in the industry and beyond. The merger provides advantages to both sides. Airbus can now offer smaller passenger jets with its own product portfolio without having to invest in the development of such aircraft in the company. Bombardier's CS-100 and CS-300 aircraft have already filled a vacuum that Airbus could not previously fill, even with its smallest aircraft, the A318. Airlines that have already placed orders for the C-series aircraft include Swiss Air Lines, airBaltic and Delta Air Lines. Bombardier, on the other hand, will receive a much needed cash injection that will prevent the company from knocking on the door of the government and the taxpayer to ask for another ransom. The agreement is also expected to eliminate the C-series program from accusations that it had been unduly subsidized against the NAFTA and WTO rules.